We knew this was coming. We knew Bruce Wayne would be Batman again. We even knew how it was coming, because they pretty much told us. And with issue #50 on the horizon, it wasn’t tough to figure out when it was coming. It was just a matter of execution. How would they construct the scene, what chords would they strike, how they’d set the table, etc. 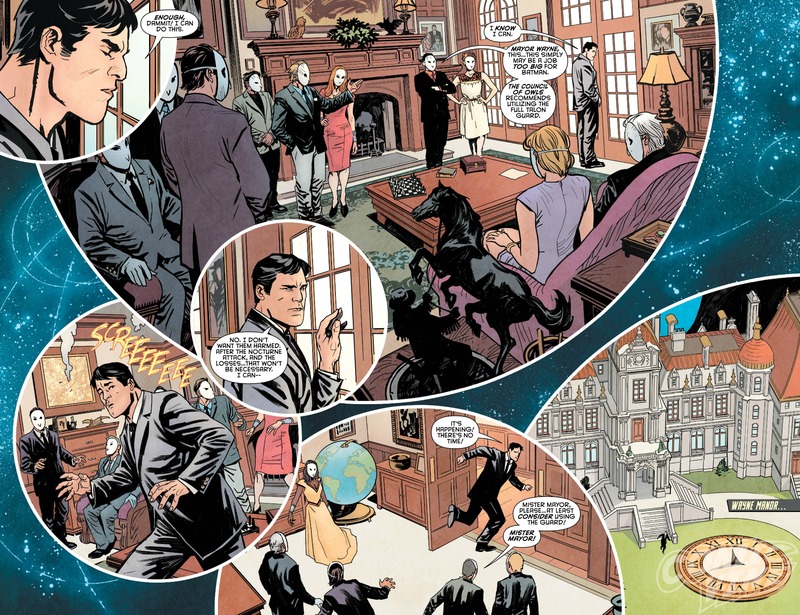 Everything that’s been building for Bruce Wayne since Batman #41 comes to a head in this issue. 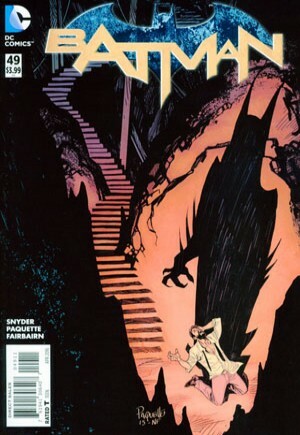 For the most part, Scott Snyder and guest artist Yanick Paquette deliver on the pay off. But we take some weird, unexpected detours along the way. Quick history lesson: In Detective Comics #27 (the New 52 one, not the 1939 one), we saw a short story by Snyder and Sean Murphy in which Batman creates a gizmo that allows him to transmit his consciousness into younger clones of himself. Ergo, Batman can (and does) live forever. 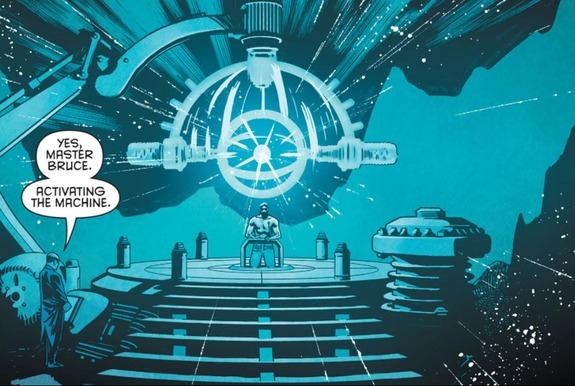 In Batman #43, Snyder and Capullo introduced this same device into the “Superheavy” plot. As Alfred explained it, the machine could reinsert Bruce’s old memories into his altered mind. As for how this brain-altering gizmo works…some questions are better left unanswered. We’ll file this one under “Comic Book Science.” And within the boundaries of comic book science, this idea makes sense for Batman. He has a contingency plan for seemingly every scenario, including (and perhaps especially) his own death. In any event, the gizmo had been established, and we knew this was coming. What we didn’t know was coming were the ways the machine would effect Bruce’s mind. Throughout the issue, Snyder and Paquette show us various alternate Batmen in different settings, and how they die. When we open the issue, we’re in a scene where Bruce is the mayor of Gotham City, is married and has a son with Julie Madison, and among his confidants are the Court of Owls and Joe Chill. The idea, as I understand it, is Bruce’s mind isn’t accepting the memories, and thus they’re distorting in different ways. This is incredibly confusing at first, and in my case it took awhile to sink in. In the end, it kind of works. I get what they’re going for. It’s very similar to the “Batman never dies!” theme Grant Morrison did during his run. That’s all well and good. But here’s the problem: We know Batman never dies. Yes, showing us all these Batmen sends a strong message. But I don’t see it as a message that needed to be sent. 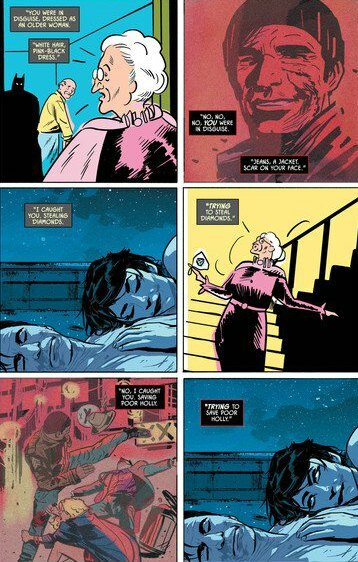 Considering all that’s happening with Bruce and Alfred, not to mention Jim Gordon being on the verge of grim death (we don’t see any of that in this issue), I’d have kept things in reality, where the true drama is. And it’s really good drama. 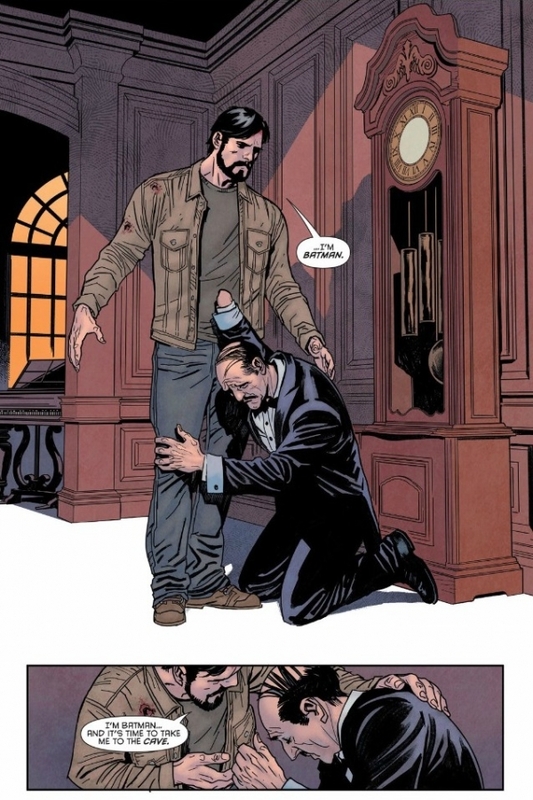 Alfred is in full on surrogate father mode, begging Bruce not to return to a life of violence, darkness, and tragedy. Snyder does a fine job bringing Alfred’s love for Bruce to the surface, even pleading with him to let the burden fall on someone else. This scene is believable for almost any incarnation of the Alfred character. There’s also some nice body language in a splash page (shown below) where Bruce finally says: “I’m Batman. Paquette shows is an Alfred wracked with emotional turmoil to the point that his knees have buckled. Meanwhile Bruce, while compassionate, refuses to back down. Snyder even brings Julie Madison into the climactic scene, having her be the one to turn Bruce back into Batman (i.e. restore his old memories and erase his recent ones). It adds a new dimension to the character that she’s earned, given her rich history. Incidentally, I’m fond of Greg Capullo’s modernized version of Julie, with the tattoos and what not. Yanick Paquette makes a fine stand-in for Capullo, who I assume was pre-occupied to drawing the extra-sized Batman #50. He hits all the right notes. Paquette was the original artist for Batman Incorporated. Thus, I found it somewhat fitting that this issue allowed him to draw an alternate version of Batman with a bright and shining Batcave, filled with techies running around, and a gigantic trophy case. I can picture this being what Batman Incorporated would look like eventually, had it continued to grow and expand. Batman #49 is a winner. Despite the bizarre course it took, it’s every bit the penultimate chapter that “Superheavy” needed. It gave Bruce Wayne’s return to the Batman role the weight it deserves, and gave us a defining chapter in Alfred’s history along the way. But most importantly, Bruce Wayne chose to be Batman again. It had to be that way. He couldn’t have been forced or tricked into it. Even with a fresh start, he still chooses the path of a hero. 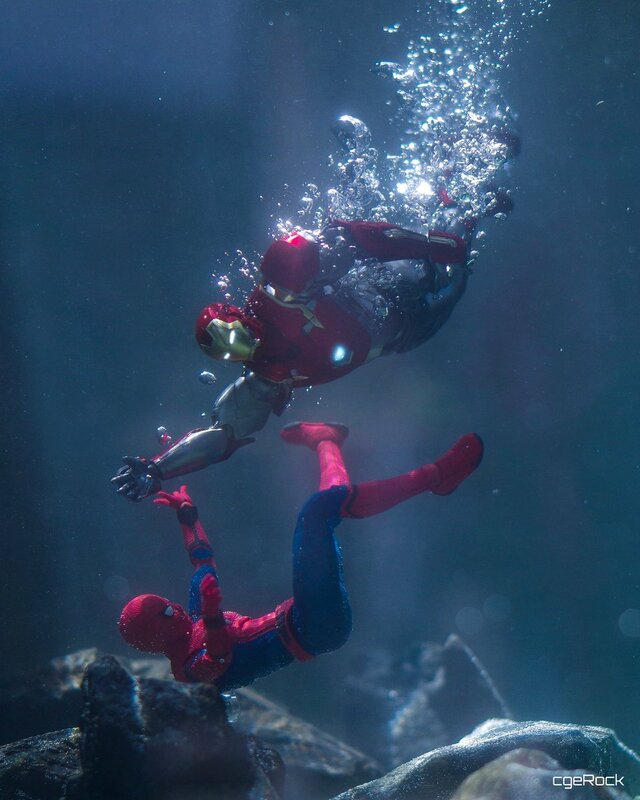 Images 1 and 3 from newsarama.com. Image 2 from comicvine.com. 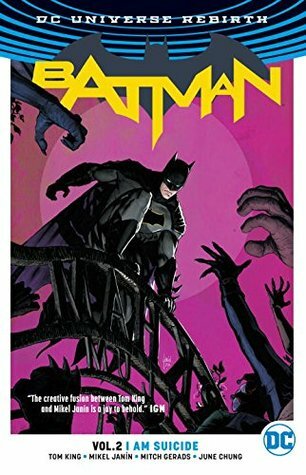 This entry was posted in Comic Books/Graphic Novels and tagged Alfred Pennyworth, Batman, Batman #49 (2016), Batman comics, Bruce Wayne, comic book reviews, comic book science, DC Comics, Detective Comics #27 (2014), Greg Capullo, Julie Madison, Rob Siebert, Scott Snyder, Sean Murphy, single issue reviews, Yanick Paquette on 02/12/2016 by primaryignition.